Today is your last chance to join Swagbucks in 2010. By joining today you will receive an extra 30 Swagbucks. Don’t let this opportunity slip away. Read through this post to find out how to earn 60 Swagbucks for joining Swagbucks, today. Normally when you join, Swagbucks starts you out with 30 Swagbucks. Today, with the special code, you start out with 6o Swagbucks. 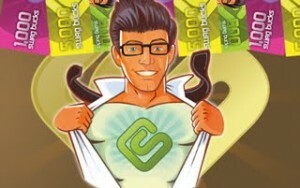 Today is also Mega Swagbucks Day! You can win BIG points today for all your internet searches using Swagbucks.com.